Charlie Immer, “When You Are Trying to Eat”. Don’t be deceived by the comically horrific subject matter, this is a serious and sophisticated achievement in fine art painting. Just stop and notice how the artist — Charlie Immer — has negotiated illusionistic three-dimensional space. Look at is as if it were a pop-up book. The artist has successfully combined a 2D flat pattern or design with a 3D rendering. It works side to side and front to back. Caravaggio comes to mind as someone who has historically achieved this. 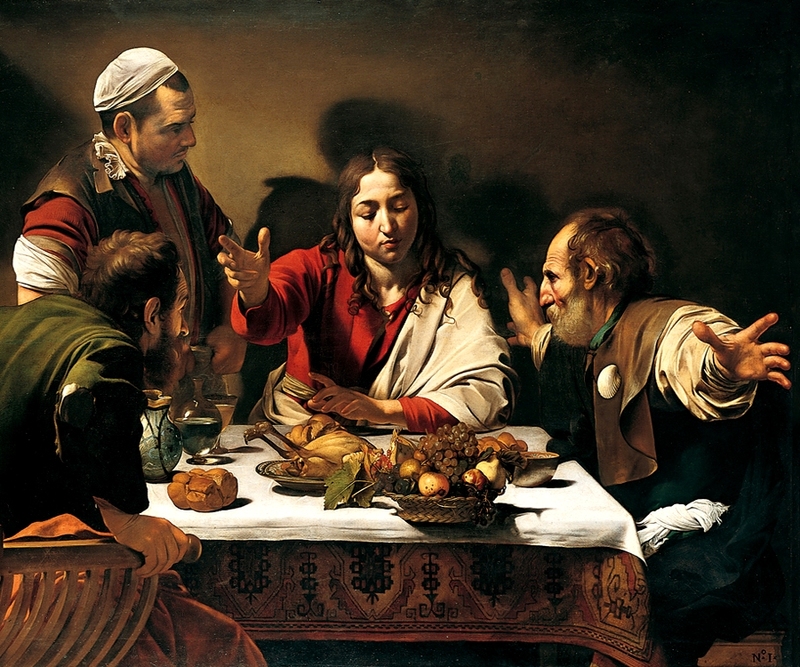 Caravaggio, The Supper at Emmaus, 1601. See what I mean? Even the shadow on the wall is similar. The content, I suppose, some might see as disturbing, but I find it charming and fun to look at. He makes his technique look easy, but I’m sure it’s very difficult. You have to be an expert on the fundamentals of lighting, shading, and modeling to achieve these effects. Immer has reduced visual reality to its fundamental building blocks, and then created a plastic sort of alternative universe populated by un-dead skeletons and the like. His color play is also quite good. The bright yellow of the skull bursting out of its head is the focal point, and his linear style with its hard edges allows for the juxtaposition of flat, appealing colors. 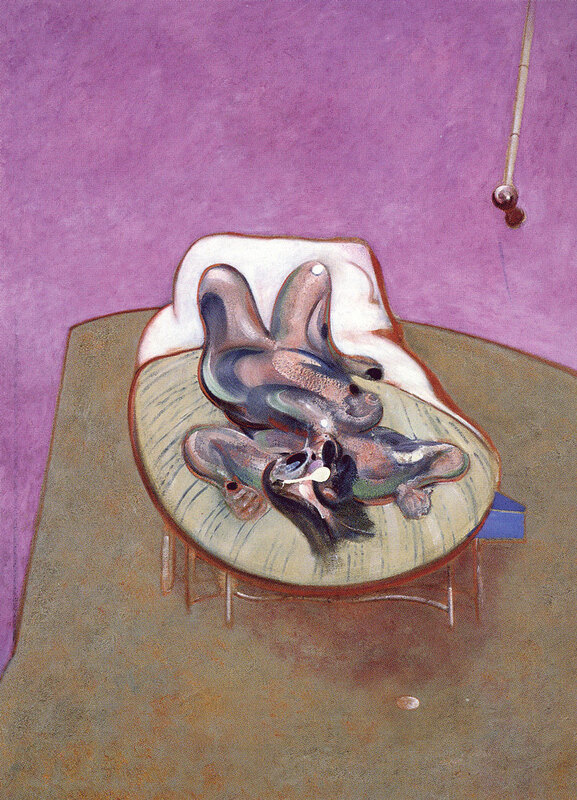 And the textured purple background kinda’ reminds me of one of my favorite Bacon paintings. Overall theres is a kind of (hard-earned) simplicity and clarity of style which is almost child-like until we consider the macabre content. 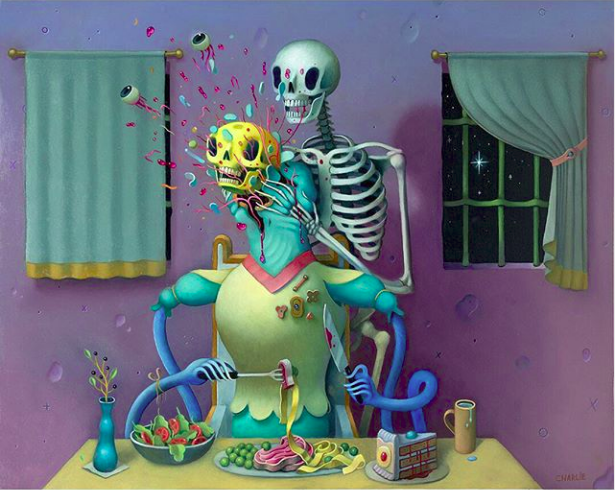 A skeleton reaches around a woman while she’s eating and pops her eyes out of her skull and her skull out of her head. It’s hard to take seriously because she can’t die if the skeleton isn’t dead, and she wasn’t exactly human to begin with, not with those noodle arms. It becomes a sort of ecstatic bursting of life on canvas, even if in the name of death. The creativity and humor are certainly erupting from the picture plane, and I sense a deeper significance that I can’t quite pinpoint. It has something to do with the way the artist’s entities assert their presence, simultaneously gleefully and sinisterly. In total the painting is a manifestation of the artist’s presence. As an artist I find myself a little jealous, in a very good way, which is a green flag when I enjoy some art. Here it’s because of the replete alternate reality the artist has created, and I think with this vessel he can potentially fill it with all sorts of content. Posted in art, art criticism, Art O' Th'DayTagged art, Charlie Immer, fantasy, horror, painting, skeleton, SurrealismBookmark the permalink.